Doctor Who and the Fescan Threat Review | Warped Factor - Words in the Key of Geek. Tony’s turning left, and going to Page 103. How can you tell that? Well, apart from anything else, he’s created a book like The Fescan Threat. You don’t do that if you’re not deeply, deeply into Doctor Who. What do you need to know about The Fescan Threat? Well, on the one hand, it taps into 80s nostalgia, because it has its roots in the Choose Your Own Adventure books that were perhaps bizarrely popular in that decade. Doctor Who dabbled in the format while the craze was on, the Sixth Doctor having adventures that allowed we young fans to play the theme music in our heads and imagine ourselves as the crotchety multi-coloured Doctor. On the other hand, things have come on a long way since the 80s. A long, long way. The Fescan Threat actually has more in common with a modern multi-player roleplaying game, or an evolved version of Dungeons And Dragons. It’s phenomenally complex, interwoven stuff, and it involves building character profiles based on the aptitudes of each individual Doctor. There’s mapping to do, different companion characters to interact with, dice to roll to determine outcomes and different adventures to have – some of which are dependent on having had other adventures first, some not. This is a Choose your Own Adventure book mated with the complexity and involvement of roleplaying games and fed straight to the heart of the typical Who-geek. 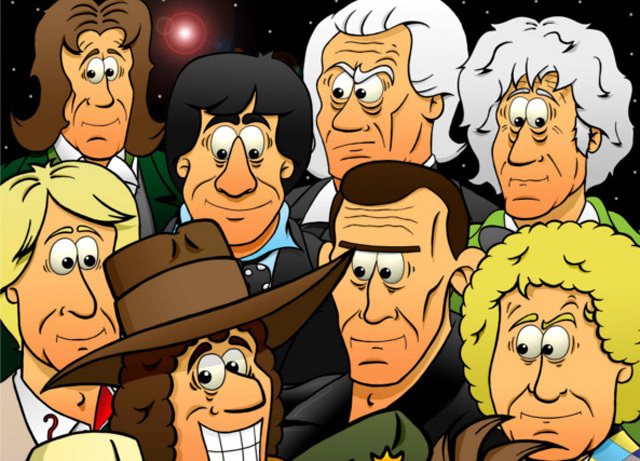 You can play as any of the first ten Doctors, and in fact, ultimately have to play as each of the first ten Doctors to get all the way through to the end. Whereas in the 80s, you were frequently limited to not so much ‘choose your own adventure’ as ‘choose between the two options we give you,’ Stone’s modern version really does deliver a kind of literary ‘Grand Theft Auto’ freedom – certainly, passages guide you in directions based on the consequences of your previous decisions, but in essence, this is the Choose Your Own Adventure book you disappointedly longed for after finishing the 80s versions in an hour. That comes from a rational understanding of quite how many points in any adventure have alternatives, so you can choose many more points than you could in the old days, leading you in any number of different directions. You’re not running past things in The Fescan Threat that will have you shouting at the book ‘I wanted to do X!’ Stone, like the fan he is, has had the same thoughts, and so allows you to choose that option, even if you discover why in fact it’s not the panacea option you thought it might be. The point is, you can choose it – over the course of 2000 separate choices and 600 A4 pages, Stone gives you the kind of freedom you always dreamed of. That means you’re not finishing this adventure in an hour. You won’t want to finish this adventure in an hour. Stone, who has created The Fescan Threat with all profits going to MIND, the mental health charity, has done his homework, and has built the adventures here in a consuming way that rings true to each of the Doctors. The story of the Fescan invasion (the Fescans follow a classic linguistic thread in Doctor Who – as fish people, akin to both the Pescatons and the Piscons, their name is close enough to trigger those associations) and the events that unfold as a result might not initially sound like enough of a pretext to sustain so large an adventure, but again the number of choices available to you, and the variety of consequences that makes the threat entertaining all the way from start to finish. Stone’s writing of the story-chunks is entirely serviceable, if not entirely spectacular – certainly it’s good enough to keep you turning to the next consequence-page, and the next one, and the next one. The puzzles range from straightforward to positively fiendish, meaning you can never really get blasé about your strategy going through, adding to the unpredictability and the enjoyment of the whole process. And for the most part, he avoids the other great downfall of the original Choose Your Own Adventure stories – the unwieldy ‘we can’t be bothered to go further down this path with you’ sudden death or return to the start. Again, the sense of Stone having trodden the pathway of the player is palpable, like playing D&D with a dungeon master who’s an experienced paladin and has fallen foul of all the shortcomings of poor DMing in the past. It’s the kind of care that makes this an extraordinary ‘charity’ book, and makes the player think Stone and his adventure-books could have a ‘for profit’ future. That said, right now there’s only going to be a single printing of The Fescan Threat, and pre-ordering is necessary. Worth buying? Beyond question, yes – Stone has done enough to make what could in some circumstances have been a lame throwback to the 80s into a re-energising of a genre in a way that goes beyond the faddishness and fashion of its original era, and offers something fan and engaging for Who fans of every age.